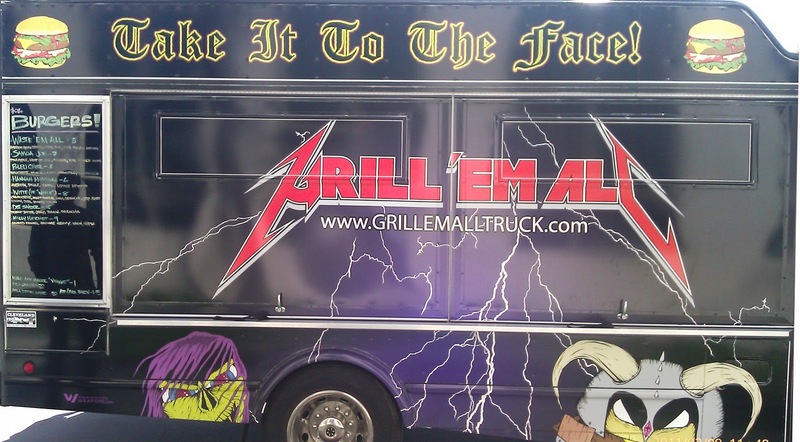 The Grill 'em All truck had recently won the Great Food Truck Race. Fat Bruce Lee and I had been meaning to try their much-hyped burgers for quite some time. 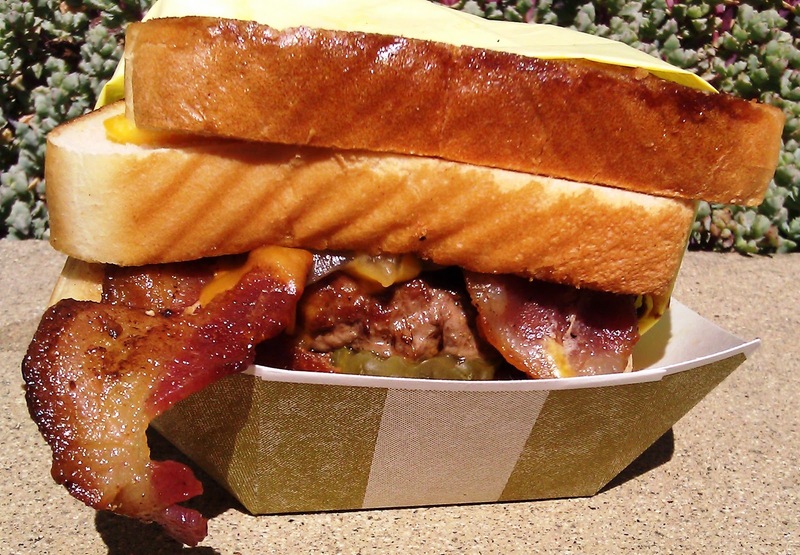 On this particular day, the burger truck was serving lunch a convenient 8 blocks from our world headquarters. 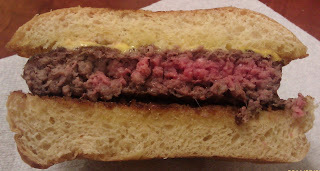 Naturally, we drove there--lucky thing--there was no seating, so we rushed the burgers back for dissection and analysis in our state-of-the-art culinary lab. Note: If you don't want to wait in line for a LONG time, show up 20 minutes before the truck opens, and be the first in line. Fat Bruce Lee did not get fat by accident, so he ordered The Behemoth--a bacon cheeseburger between 2 full-sized grilled cheese sandwiches (Texas Toast). I ordered the Hannah Montana (plain cheeseburger) and a Molly Hatchet (fennel sausage gravy, maple syrup, and bacon toppings on burger patty). They were precooking burger patties, so our burgers were ready in less than 5 minutes. The Beef: The 7 ounce patties were 80:20 Chuck, which was surprisingly bland, considering the fact that Grill 'em All promoted the beef supplier on their website. They sourced that beef from Rocker Brothers Meat and Provisions, but this tasted just like generic, characterless, Costco beef. There was no blood, no aging, no beefiness, just a mouthful of...blah. It was also greasy as hell. Like Apple Pan, the cooking smells that emanated from the kitchen were far better than the flavor of the final product. The Seasoning: I noticed a big box of sea salt on the shelf, but almost none of that made it onto the burgers--the burgers were sorely lacking in seasoning. The bland beef really needed a hit of salt and pepper to develop some sort of flavor on the palate. The Sear: Boom! They got a fierce sear onto the burgers. The sear was crisp, dark, even, and it had a hint of char--it was the best thing about the dish. Sadly, the beef was so insipid and under-seasoned that the sear only provided texture, and it did not serve to enhance the flavors of the dish. The Preparation: The beef was ground at a medium-coarse setting, and the burgers were cooked to a moist but overly greasy Medium/Medium Rare. Grill 'em All cooked the burgers on a ferociously hot gas griddle. The beef was not overworked in the least, so the texture was perfect and tender, and this allowed the coarseness of the grind to shine through. Had they used a flavorful cut of beef, this would have truly been an excellent touch. The Cheese: The American Cheese on the Hannah Montana was perfectly melted. 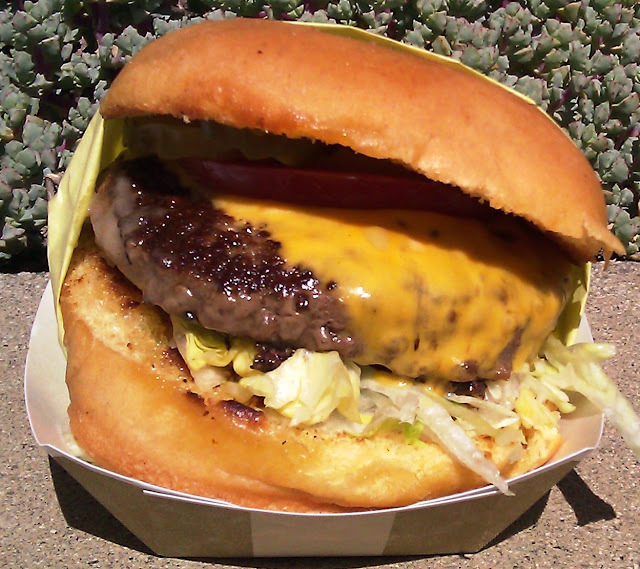 Sadly, any savory notes from the cheese were dominated by the cloying sweetness of the bun. The Bun: The bun was moist, chewy, beautifully-toasted with butter, but WAY TOO SWEET. The sweetness and the butter overwhelmed the bite. The unseeded, brioche-style bun came from Wheatland Baking, and I hope to never encounter one of these sweet as a doughnut buns again unless it is covered in frosting and served as a cake. 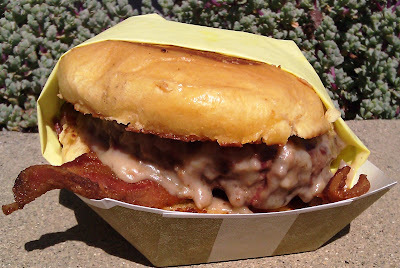 On the subject of sweetness...in the case of the Molly Hatchet, the sweetness of the bun coupled with the maple syrup overwhelmed the savory and umami flavors that I expected from the bacon, beef, and the sausage gravy. They managed to wreck sausage gravy AND bacon--in some states, that would have been a hanging offense. The Meat to Bun Ratio: The ratio was perfect, but the flavors were so off that this was a moot point. The Value: 6 bucks for the Hannah Montana and 9 bucks for the Molly Hatchet. Neither burger was good enough to finish. The portions were generous and filling, though. The value was fine. Finally, a burger that even Fat Bruce Lee could not finish. Based on our experience, we suggest that you not wait in line for a bland gut bomb from the Grill 'em All truck...it was not worth it. Maybe they would have been better had we been drunk, but we were pretty drunk by the noon opening, and we didn't care for the burgers. We understand that this review will be wildly unpopular with the 15,000 plus Twitter followers that Grill 'Em All has amassed, but we call 'em like we eat 'em. We did pass the burgers around to our enormously talented staff to try, and the overwhelming consensus was that these were sub-par burgers. It was the ingredients, and not the skill of the staff, that caused this burger to fail. The burgers were prepared expertly. It was the tasteless beef, the lack of seasoning, and the overly sweet bun that dragged this burger into the "Do Not Want" range. The same cooking techniques with suitable ingredients would have resulted in a huge win. 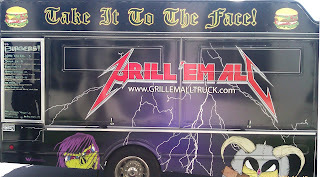 Burger Review : The shtick and promise of the Grill 'em All truck was metal, but these sweet, bland burgers tasted more like a Creed/Nickelback collaboration than Metallica.